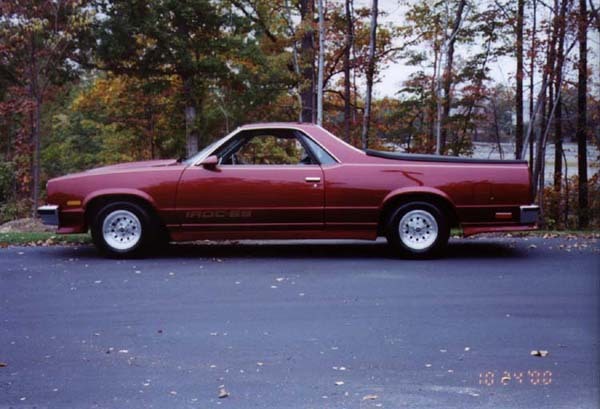 This 1986 El Camino was purchased during January 1999 and restoration was started during September of 1999 with the replacement of the 4.3L V6 including all of the engine compartment components. New suspension, springs and shocks were added. The truck went into the body shop in January 2000 for a color change and customization. This was completed in October 2000. 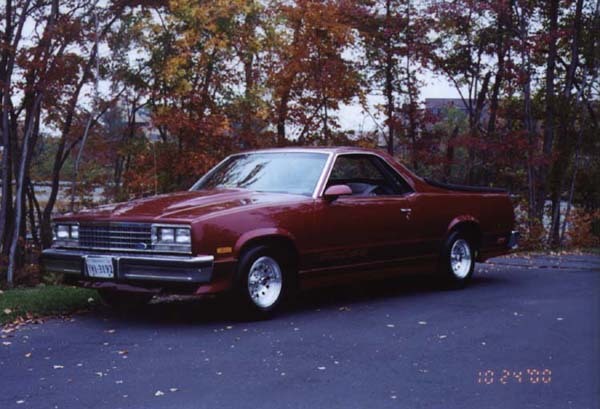 After the restoration of my 1983 El Camino I learned to replace EVERYTHING when doing a restoration. It just seemed that what ever I did not replace, broke. You can click here to see the 1983 and this 1986 before pictures. Depending on the amount of sunlight the color changes brilliants. This is due to "flop". The sunlight brings out the gold metalic. The color choice is a Mitsubishi 2000 "Patriot Pearl Red"
The truck sports a gray interior with a AKIA CD player and rear suspended speakers. 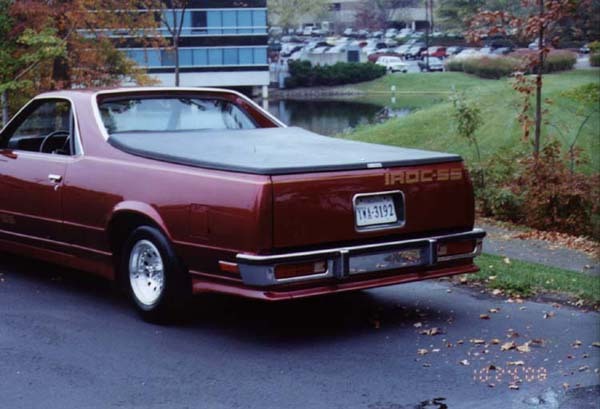 The bed lid is two piece of reenforced fiberglass. It is spring loaded and has a key lock. The bed has been sanded and painted in red. The bed was sprayed with a textured paint mixture. 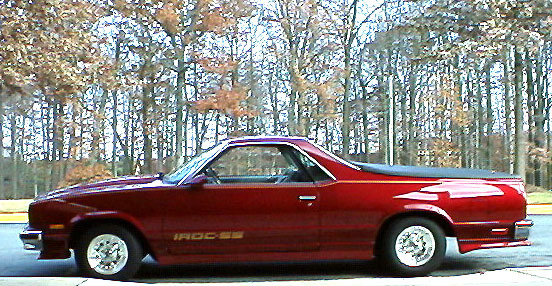 The wheels are 14" American Racer forged alloy. With 360 degree ground effects, the truck provides a lowered look. 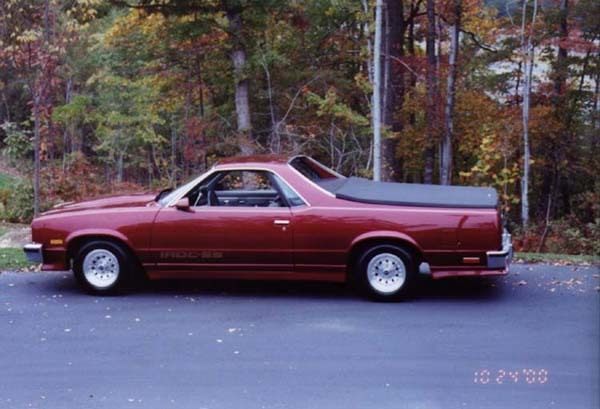 A cowl induction hood scoop was added as well as a new grille, head light bezels and a windshield. 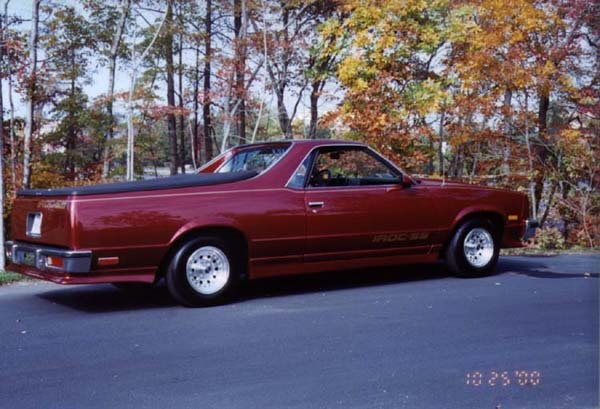 The El Camino was coverted to a "IROC SS" using Lauren Engineering components including a fiberglass tailgate. The rear bumper has been rechromed. Gold pinstriping was added after the five coats of clear had hardened. Under the hood is a black 4.3L fuel injected V6. The engine compartment has been painted in a Metalic Black.